Pack the Feeders in the bottom 3/4 of Cube bag and the 3-D Sentry in the top 1/4. 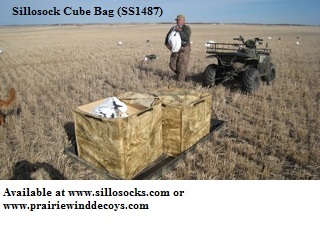 Each bag will hold 200+ decoys. These bags stack extremely well. Feel free to call or email us with any questions, concerns, bulk orders, shipping quotes, and Outfitter pricing. Enjoy your hunts! We appreciate your business. **SALE** Normally $72/dz....ON SALE NOW FOR $64.95/dz!!! PLUS FREE SHIPPING!